In 1987, a grey filly is orphaned. She is feisty, though, and thrives in spite of a shaky beginning. Her name is Two T Whiskey Royal. When the orphan is two, someone starts riding her. She bucks – a lot! Enter Doug Milholland. He likes her, deals with the bucking problem and becomes co-owner. He puts her on a training program and starts making payments into the 1990 NRHA Futurity. He changes her name to Silver Anniversary – because that year is the 25th anniversary of the NRHA Futurity. In late November, in Oklahoma City, Silver Anniversary runs the first two go-arounds of the futurity with Doug Milholland in the saddle. They do not qualify for the finals. They are, however, within one point of the qualifying total and eligible for the consolation round. If Silver Anniversary can win the consolation, she can compete with the other finalists for the championship. She wins the consolation round. In the meantime, Doug competes in the Freestyle Reining on another horse. What music does he choose? He selects Run ForThe Roses, the song that will be playing when the Futurity Champion enters the arena for award presentations on the final night of the show. He wins the Freestyle. As winner of the consolation round, Silver Anniversary must compete first in the finals (a distinct disadvantage) and she has already run one more reining pattern than the rest, but the pretty little grey mare delivers and scores a sweet 219. Many years, that score, though good, would not hold up for the championship, but as horse after horse finishes pattern number 5, no one tops 219. Silver Anniversary wins the Silver Anniversary running of the NRHA Futurity! 1. Doug changes the name of his futurity mare to Silver Anniversary because the year she will be competing in the NRHA Futurity is the 25th anniversary of the show. 2. Doug rides his Freestyle at the same show to Run For the Roses, the music that will be played for the Futurity Champion. 3. Silver Anniversary and Doug Milholland win the NRHA Futurity. It seems to me Doug Milholand never lost his focus. In the spring of 2006, a sorrel colt sired by Dual Rey out of Boon San Kitty is born on the Rockin W Ranch in Millsap, Texas. Alice Walton names the new baby "Rockin W" (the only time she named one of her colts after the ranch). For three years, as Rockin W grew up, the ranch funnels “Rockin W Ranch energy” through the sorrel stallion and plans for the 2009 National Cutting Horse Association Futurity. In December of 2008, Tony Piggott starts working as resident trainer on the ranch ... and riding Rockin W, now a long two-year-old. 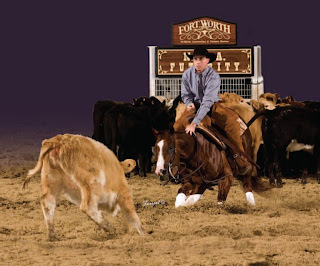 Piggott continues the horse's training with the goal still the NCHA Futurity in December of 2009. Though the stallion's former trainer is given first chance to ride Rockin W at the Futurity, he turns the offer down. (Bet he's re-thinking that decision!) so Piggott shows Rockin W not only to the finals (first time ever for Piggot) but to the 2009 NCHA Futurity Championship! Now Rockin W Ranch stands a NCHA Futurity stallion named Rockin W. Can it get any better? A man is choosing a stallion for his mare. He searches the internet for stallions he likes. He finds several but he cannot make up his mind. Thinking about his options, mulling over the pros and cons of each, he goes for a walk up the mountain behind his property. Suddenly, he knows. He knows because, there in front of him, is the answer - wolf tracks! He is walking with wolves . . . and he books his mare to Walking With Wolves! It's no accident that Silver Anniversary won the 25th Anniversary of the NRHA Futurity. It's probably not a fluke that Rockin W won the 2009 NCHA Futurity. And it's not coincidence that the mare owner was given a sign indicating the best stallion choice for his mare. The logo for Wildwood Reining Horses is the combination of a horse and wolf. I named my two stallions Running With Wolves and Walking With Wolves. There's a reason for that. The wolf lives his life with integrity. He protects his own. He is gentle-hearted but not cowardly. Best of all, he is loyal. That's Positive Power. I committed to posting a blog every Monday, and I start thinking about what I will write a few days before that, but last week I could not put anything together. Not for lack of topics - Valentine’s Day, the Olympics - but I needed something else… Then, Saturday evening, the phone rang. It was not good news. 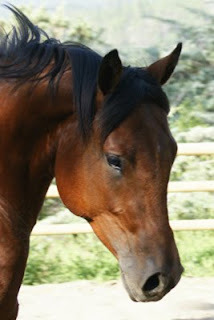 A friend of mine had just buried her mare – her companion, her confidante, her heart. We talked about her mare, about horses we had lost and about how we cope with losing one. We philosophized a little, looking for answers, I suppose, and comfort. Then we discussed the fantastic opening ceremonies for the 2010 Olympics. I think we even mentioned Valentine’s Day. After I hung up, I searched for a connection between these three events, the significance of Valentine’s Day, the Olympics and the death of a special horse. Two words came to mind – “Believe” and “Love” from the first two events – and how those two words applied to the third. We do not doubt our love for our horses but are horses capable of that emotion? Many will scoff at that idea, but I believe (there’s that word again) horses can love… and they do. They love other horses and they love people. The stable mate of my friend’s mare calls out for her companion; she waits by the barn door head down, eyes dim. She is in mourning. I remember another story of a beautiful young mare in acute pain with colic, that lifted her head one last time and whinnied for the girl she loved when she came to say goodbye. And so many stories of affection from my horses on a day-to-day basis. So, to use a very old phrase, “I believe in love”, pure and simple. And not just a man/woman love, but the broader context. I believe my animals, especially my horses, love – each other and me, and I believe Olympic athletes love their sport more than they love the win. It will be months before my friend can remember her mare without shedding tears, years before a month goes by with no thought of her friend, but she believes she is part of bigger picture now. She takes comfort in that and in remembering the love of a kind companion. Today is my brother’s birthday. I think about that February day and where he was born. I think about the circumstances of his birth . . . and I remember two grey mares. My parents ranched in the Coteau Hills of Saskatchewan, isolated from the settlement by hundreds of acres of rolling grassland. Though a rough trail accessed the Diamond Dot Ranch in the spring, summer and fall (when it didn’t rain! ), motorized travel was impossible in the winter. Then horses were the only way in or out. 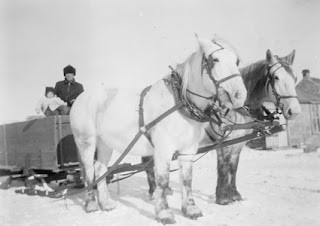 Most often Mom or Dad rode but if the family all went (a rare occasion), we traveled by horse drawn sleigh. The only horses I remember pulling that sleigh were The Grey Team. Dad harnessed The Grey Team almost every day. They pulled the mower, rake, hayrack and stone boat; they hauled the hay to the stack; they hauled it from the stack to the cattle; they pulled a stone boat laden with manure, rocks or fence posts. And sometimes in the winter, they pulled the sleigh, a wooden box on runners. 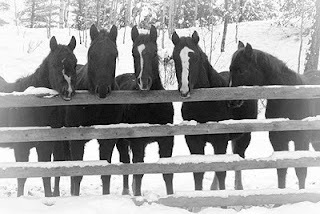 Thus it was, in late January 1946, that Dad hooked The Grey Team to the sleigh to take his wife, eight and half months pregnant, and two-year-old daughter to a friend’s farm. The Grey Team pulled the sleigh over twelve miles of snow-covered, uninhabited hills to the farm at the edge of the settlement, where Mom and I stayed. Then Dad “sledded” home to care for the livestock. The friends would transport Mom to the hospital for the birth when that time came. Since there were no telephones, Dad could have only guessed when he should return for his family. In any case, when my brother was two weeks old, Dad returned to pick up us all up and take us home . . . with the sleigh and The Grey Team of course. Bundled up in wool, we snuggled together under cowhides in the bottom of the sleigh as Dad faced the desolate distance once again. The trip should have been uneventful, but several miles from the Diamond Dot, the weather changed. A sudden blizzard blew in. Snow driven by gale force winds pummeled sleigh and horses, obliterating the landscape and driving them off the trail. Blinded by the icy pellets, Dad fought to keep his bearings, but the storm won. He lifted the cowhide covering his family. “I don’t know where we are,” he told Mom. I can only imagine how he felt. Lost in a Saskatchewan blizzard, he had only one choice—he must place the lives of his family in the capabilities of the dependable mares in the traces. “Giddap,” he said, as he loosened the lines to the mouths of The Grey Team. “Take us home.” And that’s exactly what they did. Skirting snow-leveled draws and deep buck brush that would have halted the sleigh, over hill after hill of endless white, bowing their heads to the driving, relentless blizzard, they delivered their family home to the little ranch house in the valley. January 2010 is done. It’s my least favourite month – post Christmas, ridiculously-short days, frigid temperatures, snow to shovel and plow, a never-ending cycle of forking hay to horses and cleaning manure away, water troughs to fill, water troughs to unthaw, de-icing everything, more frigid temperatures, more snow . . . green grass, new foals and reining shows too far away to imagine! January usually seems longer than the thirty-one days it is. This year not so much. After a wicked December (-40 twice, lots of snow), January was kind. I took advantage of long evenings to catch up on jobs (like mending horse blankets) and to start a new hobby. Although riding was trimmed down to not-too-enjoyable, bundled up, circles in the snow on slippery footing for my young stallion (who I must continue training if he is to compete in 3 year old reining futurities), I had more time to read Quarter Horse News, peruse tack catalogues, check out reining and performance statistics, transfer 2009 video to my computer, update my web page and make Fan pages on Facebook for my stallions! I planned and dreamed about spring and summer activities. January slipped by. I turned the page on the calendar . . . and flipped a switch in my mind.